Some boats do not have the possibility to fit a tunnel thruster and thereby require a retractable thruster. 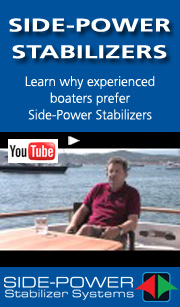 Side-Power have designed a product range that address known weaknesses in retractable thrusters, namely the sturdiness, reliability and speed of the in-water propulsion parts to offer retractable thrusters in true Side-Power spirit with no compromise on safety and reliability. The retracting thrusters are generally built with the same high safety standards as all Side-Power products, and incorporate the important benefits introduced with the SE-series thrusters. Our focus on safety is a totally integral part of the product design so that everything from build quality to ease of installation is thought of to ensure long term reliability. There are two versions of the retractable thrusters, one model design for direct mold-in, and one designed to be mounted on a flange. The flange can be a mold-in base from Side-Power, or the boat builders can manufacture their own base in materials suited for their hulls or as part of their basic hull design.